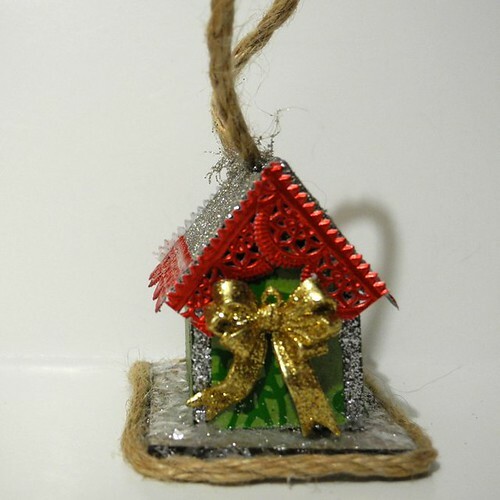 Just Jingle: So, to make Christmas Ornaments you pretty much just dump everything in glitter, right? 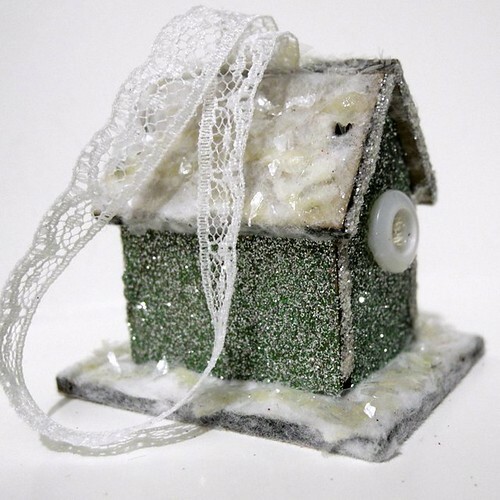 So, to make Christmas Ornaments you pretty much just dump everything in glitter, right? 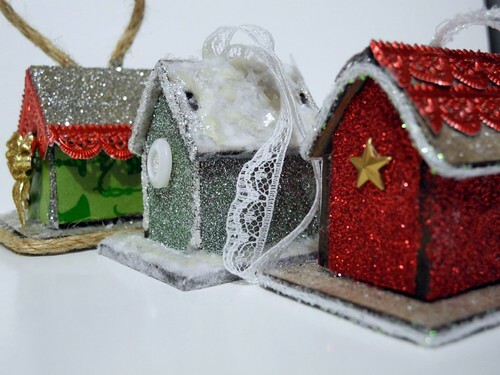 'Cause that's pretty much the route I took with these fabulous little mini chipboard houses from Retro Cafe Art Gallery. Just say'n. And it was FUN STUFF, people! For reals! HOLY LOTTA GLITTER, BATMAN!!! 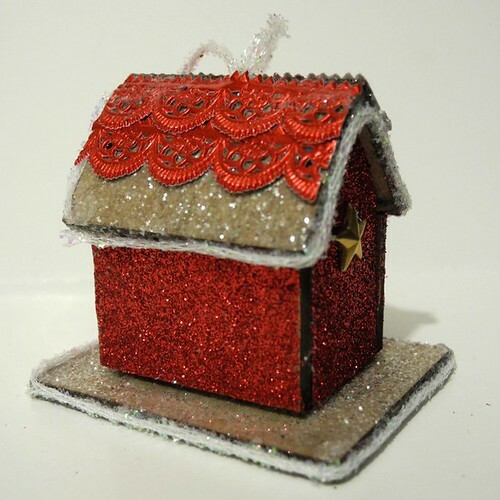 The first of the three is this adorable red house. This is, perhaps, the nice middle aged couple down the street. They have the two car garage, the perfectly manicured lawn and the barn star positioned just perfectly. Their holiday decorations go up appropriately just after Thanksgiving. You know them, right? They keep the decor simple, but festive and pretty. Lovely, isn't it? And then...well, then there is those people down on the corner. You know the ones. They have every blow up decoration ever invented, colored lights all over the place, animated santa and reindeer lifting off the roof, and who KNOWS what else in that yard. You seriously have to wonder what their holiday electric bill looks like. Particularly because they put it all up on Halloween! HA! Speaking of happy!!! Check out my workspace this week! It's filled with Happy!!! Lots of fun things going on and I even took a wide shot so you can see the happiness that is the messy studio I love so much! YAY! To see more fabulous WOYWW workspaces check out Julia's blog! these are so cute! i love all the glitter! wow, I do love love your studio, I could spend many happy hours playing in there! love your little street of houses and your tale of who they belong to! Ooooooh! Glitter Heaven! I'd be EATING glitter for the next YEAR, tho'! I just make the BIGGEST mess with it! 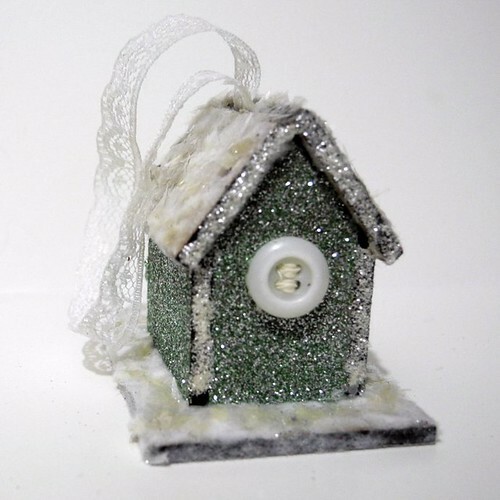 But I have to say, lil' Jen, those houses are so fabulous, I MAY break down & pull out the glitter! Seriously! LOOOOVE 'em! Also love your dialogue about them! You are happy lil' cuteness! I want to play in your workspace, by the way! Love the houses - they are so cute. Christmas is one of my favorite holidays to decorate for. Thanks for sharing. Can I come over and play too!! Relief - no sign of the exercise mat - I can come out for a proper look!! LOVE the houses, really love 'em, and the back story! Right now I'd be in the humbug house, unlit, undecorated and uninspired! ASk me round to rummage in your studio space won't ya? Those are ADORABLE! I'm all about some sparkle! I am lovin the glitter, these are awesome! oh Wow, your space is soooo full of colors and textures and stuff! LOL Those ornaments are simply terrific! Great glitterama! Always love your post... guaranteeing smiles!! Love glitter...love anything with glitter..can never...EVER..have to much glitter..hehe!! Those houses are cute. Now as far as your work area...a messy place is the best place. Well..in an art space area that is. Those little houses are just too stinkin cute!!!!!! 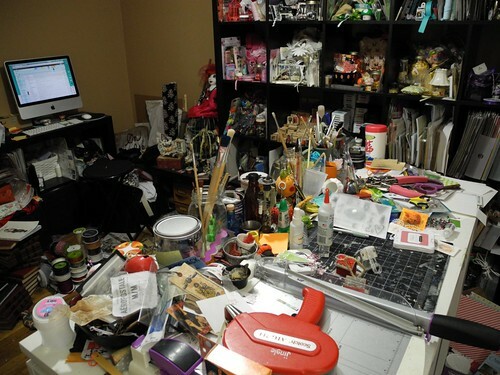 and your workspace~WOW~that looks so yummy!I just want to get in there and pick through everything!!!! These are just beautiful!! Our neighbors with all the blow up stuff live right across the street. Not only do they put up blow up stuff for Christmas, but also for Halloween. It's insane. When my friends ask why they have all the Halloween stuff in their yard, I shrug my shoulders and say "Well, they're from Vegas." 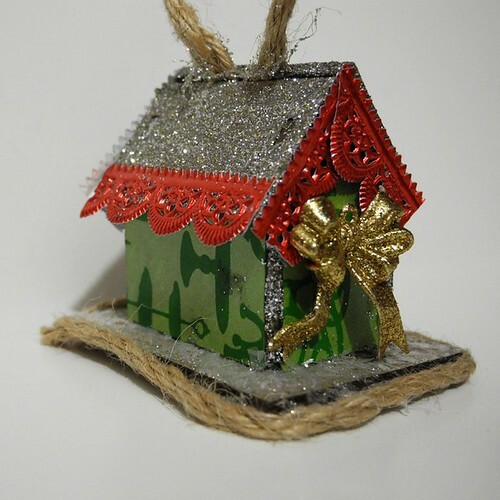 Absolutely great, love your mini houses - and the more glitter, the merrier! You can never have enough glitter....these are gorgeous! These are all awesome. I really love how you described them, too cute. Your workspace looks like SO MUCH FUN1!! When I was a little girl, we had houses like these that were covered with glitter. I still have some. They are very old and very cool. Fab post... adore those teeny houses and your desk does look HAPPY as a result. Great! Love them!! Everything looks great with lots of glitter! 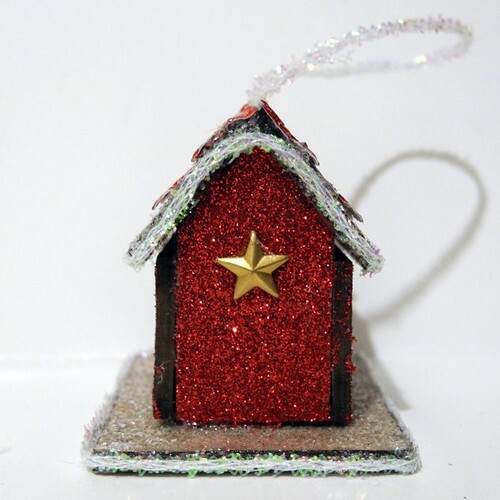 Love your glittery fabulous ornaments!!! And, if your workspace means happy- then I am right there with you!!! Bet you have glitter everywhere! But, it's worth it! Great job... And messy desk (just how I like it). I love your cover, with all the.......... ZIGZAG! (Yes, I learned my lesson). OMG!! I just saw these yesterday at Donna Downey's studio! 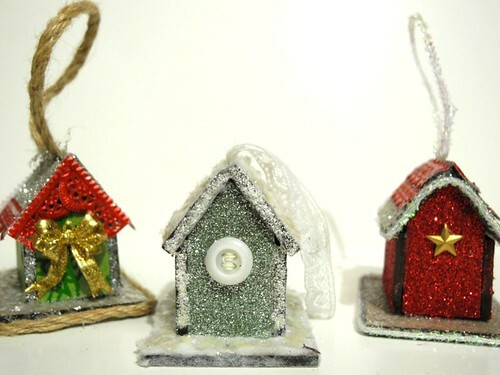 They are so cute and Jingle yours are FABULOUSly glittery and gorgeous!! For being # 1 this week, I'm awfully late visiting. I'm so sorry but, after a computer crash, I had to stop by and get a bit of inspiration from your glittery houses. Of course, your desk is pretty much a disaster, but I know that is what makes you happy!